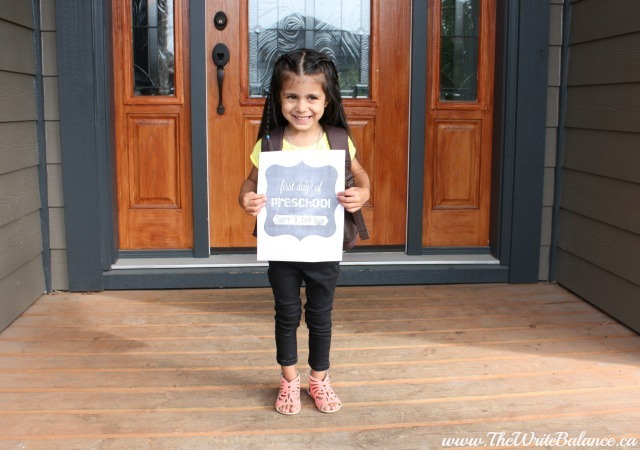 On Tuesday Sept 9, Kyah started her first day of preschool. She had a good sleep and woke up to a chocolate chip pancake breakfast with chicken sausages and fruit. You need to fuel up for your first day of preschool right? Kyah picked a new yellow shirt to wear because it’s her favourite colour. We packed her lunch box with a snack, filled her new water bottle, packed her inside shoes and then we were ready. 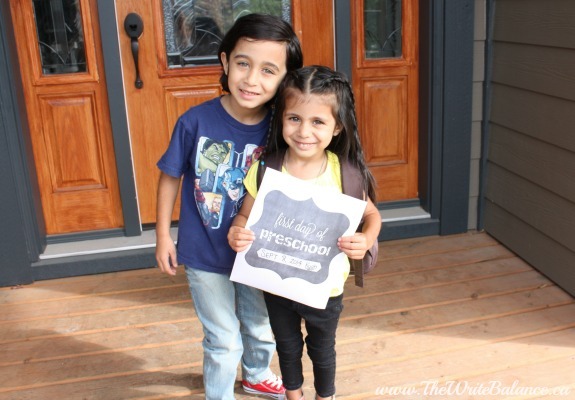 Except of course we had to get first day photos! I had printed out a first day of preschool sheet so she could hold it in front of her. But before I could start, her brother already had his camera out and was clicking away! It was so adorable. After we had a mini-photo session, we got in the car and headed to the school. We didn’t want to be late on her first day. I wasn’t as apprehensive as I thought I might be because Kyah had done a summer program with her brother where I’d left her and the first day was a pretty traumatic experience for both of us. So I was hoping that it would be a better transition with no tears this time. The first week was gradual entry of only one hour each of the two days. 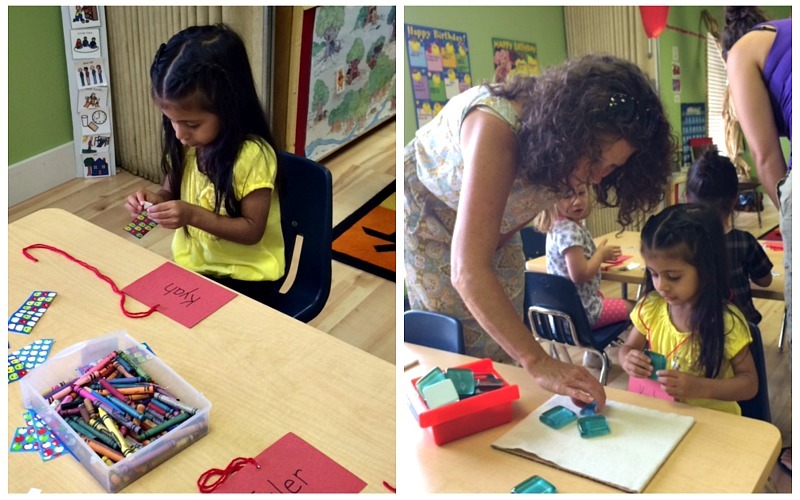 So Keyan and I dropped her off, introduced her to her teachers and got her comfortable with some toys and activities. Then we said our goodbyes. We started to leave and I just kept waiting to hear her crying, but it didn’t happen! We decided to sit in the hallway and wait (as did some other parents) just in case. But every things was okay. We peaked through the window and she was totally fine. She played by herself, talked to another student and even participated in circle time. By the time the doors opened for the kids to come out, I was bursting with pride and happiness. I gave Kyah a big hug and told her how proud I was of her. She gave me a huge smile and told me her favourite part of preschool was circle time. It was a great day for Kyah and definitely a different experience for me compared to Keyan’s first day at preschool. How did your child’s first day go? Was it a different experience for you from your other children? I hope the rest of her days at school are just as good. Thanks for sharing your daughters first day of preschool 🙂 Awesome memories and great pictures!! She is such a cutie. Preschool is so much fun. My girls always had a blast when they went. Sounds like a perfect first day to me. My boys loved preschool – so many fun activities and new friends to play with. She is such a beauty!! Glad it went well!! Thanks Sarita, I’m so glad to!